The symptoms of autism spectrum disorders can mimic a variety of other conditions, making it crucial to receive an accurate diagnosis and may lead to autism misdiagnosed. Early intervention is key for autism symptoms, so being properly evaluated and diagnosed will give children access to the best therapies for their special needs. 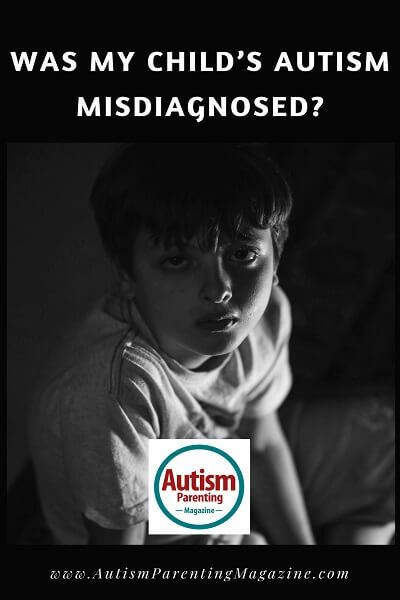 How often is autism misdiagnosed? When you begin to notice your child is not following the same developmental trajectory as his/her peers, it can be an unsettling time full of unanswered questions. You are eager to find ways to help your child catch up, ease his/her symptoms, and make sure he/she has the accommodations necessary to succeed in school. Before a plan of action can be put into place, a diagnosis is needed. While each child with an autism spectrum disorder (ASD) will present differently, having a diagnosis is an important foundation for obtaining help for your child. Not only will a diagnosis provide a framework for what ASD looks like for other children (and quite possibly your child) it is needed by most schools to provide accommodations via an Individualized Education Plan (IEP) in the United States, but also to be eligible for government programs and assistance. Autism exists on a spectrum from high-functioning to lower-functioning, but common symptoms and patterns exist under the ASD umbrella that can help you decide what might work for your child based on the experiences of others on the spectrum. According to the Centers for Disease Control and Prevention (CDC), about 1 in 59 children have an ASD. They have also found that ASD occurs, “more often in people who have certain genetic or chromosomal conditions. About 10% of children with autism are also identified as having Down syndrome, fragile X syndrome, tuberous sclerosis, or other genetic and chromosomal disorders.” (Autism Spectrum Disorder [ASD], 2018) They also note that ASD “commonly co-occurs with other developmental, psychiatric, neurologic, chromosomal, and genetic diagnoses. The co-occurrence of one or more non-ASD developmental diagnoses is 83%. The co-occurrence of one or more psychiatric diagnoses is 10%.” (Autism Spectrum Disorder [ASD], 2018) These statistics illustrate the importance of receiving an accurate diagnosis, or diagnoses so that your child can receive care tailored to his/her individual needs. Parents and caregivers will notice their child’s symptoms at different times. Some parents will notice symptoms before the child’s first birthday and can receive a “reliable, valid, and stable” diagnosis by age two, but most children are not diagnosed with ASD until after four years.” (Autism Spectrum Disorders [ASD], 2018) The Autism Science Foundation has curated a list of common early signs of an ASD in infants and children that are usually indicators that your child may need to be evaluated. Screenings for autism are typically done at 18 and 24-month check-ups, but if you notice signs of autism in your child sooner, do not hesitate to contact your child’s pediatrician. Developmental screenings are available at 9, 18, 24, and 30 months of age, but screenings specific to your concerns and your child’s needs can be conducted at any time. A pediatrician is usually the first point of contact for parents who notice developmental delays in their children, but sometimes children who are higher functioning may not show signs until they enter school and are faced with new stimuli, social situations, and schedule changes. Teachers are trained to look for signs of developmental delays and can be an excellent partner in helping you to relay possibly delays to the pediatrician. Once your child’s pediatrician is aware of possible developmental delays, he or she may recommend seeing a specialist to accurately diagnose your child and put into place a treatment plan. These specialists may include educational psychologists, geneticists, developmental pediatricians, neurologists, psychiatrists, speech therapists, occupational therapists, physical therapists, or social workers. How can you distinguish autism from other conditions? What is the long-term importance of accurate diagnosis? You have likely heard that early intervention is important, but equally so is an appropriate intervention. Receiving an accurate diagnosis is key to making sure your child receives the most appropriate therapies for his/her specific needs. The therapies your child needs will likely vary from other children with autism, even if he/she is in a similar place on the spectrum. One high-functioning child with social anxiety may need psychotherapy while another high-functioning child who struggles with motor skills may need occupational therapy. It is important to receive not only a diagnosis but a specified list of your child’s unique struggles and strengths. This comprehensive guide to autism treatments and therapies further outlines the variety of options available and would be an excellent starting point for identifying what might work best for your child. A creative child may benefit more from art therapy while an active child may receive more benefit from hippotherapy. Regardless of the types of therapies your child receives, the goal is always to help the child live the best life he/she can. Receiving an accurate and comprehensive diagnosis is the first step to helping your child access not only the best services to help him/her succeed in school, create family bonds, and help him/her learn a communication style that works best for your family. Very helpful and educational. This article suits not just new parents but for those who know someone who has babies. One must observe their child growth for it to identify if symptoms will occur. Thanks for sharing! As a mom of a son with Prader-Willi Syndrome and Autism, I just want to say that you cannot really split the two apart. Having PWS doesn’t mean that our children don’t have autism. I believe that the autism just manifests itself differently in PWS and other syndromes. Many of our PWS kids are not getting diagnosed because the parents believe that their kids aren’t autistic because they have PWS. Then, when their children manifest full-blown autism, they scream loudly that their kids need psych meds and hospitalization. The problem is, psychiatric care does not cure or even treat autism. If we could just cross the hurdle that co-morbidity is just that, co-morbid, I think many parents would find the real help their children need—acceptance and treatment for autism. Co-morbid conditions are especially tricky to diagnose when they present similarly. I agree that psychiatric care is not a treatment for autism when used alone, but it can play an important role as a piece of the treatment puzzle. Along with occupational therapy, physical therapy as needed, psychological care, community support, and educational support, some children benefit greatly from carefully selected medications and care under a psychiatrist or hospitalization as short-term last resort. PWS and autism are definitely hard to separate, as you said, and I too hope that through further understanding of both conditions and how they coexist, children diagnosed with both will receive appropriate treatment and care.